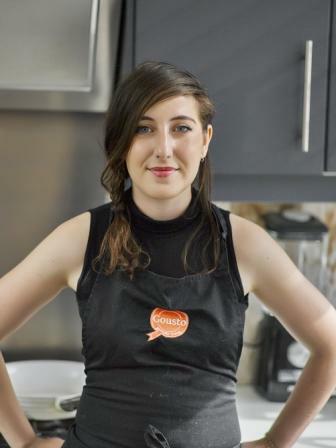 Alice Feaver is Head Chef at Gousto. Gousto creates recipe boxes containing step-by-step recipes cards and all the ingredients needed to create great tasting home cooked meals. Sustainability is key to Gousto’s food sourcing ethos, and many ingredients are also organic. Alice let me know a little about her day to day work at Gousto (and her love of unusual seaweeds), as well as sharing some top tips for home cooks. How did your career in food start? I studied Fine Art and painting at University, and while I was there I had some friends who were chefs. I became completely obsessed with what they were creating, far more so than my own course. That triggered a switch for me, and I enrolled on a catering course as soon as I’d graduated. What does your role of head chef at Gousto involve? On a day to day basis I come up with new recipes and concepts that fit into our menus. I design recipes 10 weeks ahead, always bearing in mind that people want to be excited about the cooking process as well as the final taste. I come up with concepts and initial tests, then I pass them over to my fellow chef Remi who tweaks and thoroughly tests the method before they’re put into our database. I also write copy for the recipes and style the images for the website alongside a professional food photographer. Where do you get your inspiration for the recipes you develop for Gousto? Everywhere! Blogs, food magazines, restaurants, menus, travel. London is awash with inspiration. Sometimes all it takes is a conversation with my manager (both of us are pretty greedy and can talk food all day) and the ideas come flowing. Sometimes just walking down the street can trigger an idea. The other day I walked past a box of fried chicken and I thought ‘we haven’t got a healthy fried chicken!’. What’s the most unusual thing you’ve ever cooked? I once had a bit of a love affair with unusual seaweeds. I love foraging and whilst I was on holiday in the remote Scottish Hebrides I collected a big load of the oddest, alien-looking seaweed. I went about boiling, drying and shredding them. My family complained about the smell after 2 days and I had to abandon the experiment. Which current food trends excite you the most? It’s really great to see that vegetables are at the forefront of food fashion right now. I’m loving courgetti, cauli mash and cauli rice. I’m also really excited about Korean food; anything salty, sweet, spicy and pickled, I’m there ready to pounce. – Lamb and date kofta with a really herby bulgar wheat salad and tahini yoghurt. You can whip these up in under 30 mins. – Black lentils with roast squash, beetroot, feta and a lime and cumin dressing. This not only looks dramatic, but is punchy and so nutritious. Lentils count as a vegetable in themselves – I couldn’t live without them. – And for comfort, a crispy Parmesan crusted chicken schnitzel with lemon and fennel slaw. So so good! What are your top kitchen tips that will make life easier for people cooking at home? Keep a bowl near you for scraps and vegetable peelings. It’ll stop you running to the bin and making a mess of your work surface. A tidy space = a tidy mind. When making salad dressing, use an empty jam jar (with matching lid). Add all of your ingredients and shake baby shake! Peel your ginger with a teaspoon; just scrape the skin straight off – you’ll have far less waste! What would you say to encourage people to cook from scratch more regularly? Just start simple. Cooking from scratch needn’t take hours. I always say don’t study cooking, just cook everyday, even if it’s just assembling a salad. You’ll learn along the way. Also, you’ll know exactly what you’re eating, which is so important. And break the rules! Experiment and don’t be scared to make mistakes. Cooking should be fun. Which basic recipes would you suggest people master so that they can use them across a range of dishes? – A roast dinner: once you’ve mastered the balancing act of cooking a great roast with homemade gravy, everything else will be a breeze. – A basic white sauce forms the basis for a cheese sauce, parsley sauce, mustard sauce and numerous fillings for pies and things like croquettas. – A curry: if you grasp the basic recipe for a curry, a whole world of flavour options are then open to you. It’s all about learning the order. The toasting of the spices, the slow cooking of the onions, adding coconut milk or yoghurt at the end. Once you’ve nailed it you can start experimenting with different spices. – Custard: mastering a custard gives you the building blocks for so many desserts. Add it to tarts, or thicken it with cornflour and you have creme patisserie for cakes and pastries. Churn it and you have ice-cream. The possibilities are endless.